The competition in the GPU market is getting hot day by day. With the launch of Ryzen and Vega, AMD, as thrown the card and Nvidia's already launched GTX 1080 Ti, is still the best in the market. AMD that had a strong share in the high-end GPU market in 2014 was challenged by Nvidia that subsequently forced the former out of the high-end GPU market. However, AMD has re-entered into the high-end market, with the launch of its Vega GPU. AMD has launched the Polaris GPU in 2016, which helped it to wrest some share from Nvidia, as it competed effectively against Nvidia's Maxwell GPUs, though at a low cost. However, then Nvidia released its GeForce GTX 1080 Ti in March this year and GTX 1080 Titan XP GPUs in April, giving it an edge to the GPU market. Around the time, AMD has unveiled its next-gen line of graphics card Radeon Rx Vega. AMD, however, delayed the launch of its latest Vega GPU to the third quarter. Though a late contestant, expectations are good. AMD is gearing up to launch its Radeon RX Vega cards at SIGGRAPH 2017, on July 30. Nvidia was active in popularizing this term, as it sold it's GeForce 256 as the world's first GPU in 1999. However, after that Demand for GPUs has been on the rise due to the evolution in graphic games and as technologies like the augmented reality (AR), virtual reality (VR) and artificial intelligence (AI) has got the momentum, as reported by Benzinga. According to a leak noted by PCGamesN AMD RX Vega performed 15 percent quicker than GTX 1080, but still, trails the performance of GTX 1080 Ti. 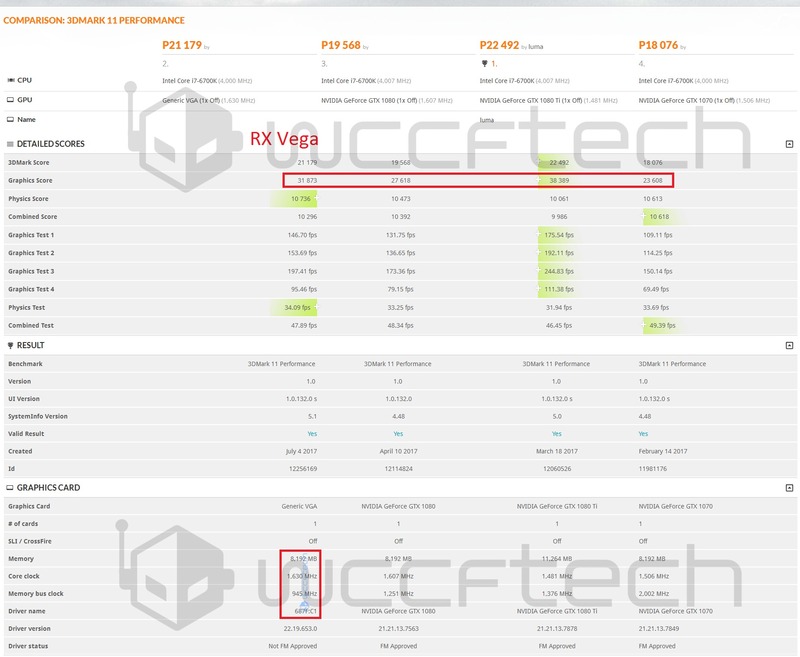 The test was performed with the old 3DMark 11 benchmark showed that the RX Vega scores 31,873 as compared to 27,618 for the GTX 1080 and 38,389 for GTX 1080 Ti.